Until about three years ago, I didn't drink coffee because I hated the smell of coffee breath. But when I moved to London, coffee became almost a necessity. Apart from those early morning travels to work, being surrounded by clever minds before eight o'clock in the morning compelled me to do something to keep up with their hyperactive brain cells, and so that I can keep moving forward until the end of the day. My old tactic of asking someone to pinch my hand until it turned red no longer worked because nobody wanted to hurt me that much. Coffee apparently works better. So, I slowly introduced my system to this energy boosting beverage. Despite not getting on well with coffee at the beginning ( I had dizzy spells and bouts of diarrhea), it is now a big part of my daily life. My 30- minute morning walk to work is now incomplete without almond croissant and a cup of skinny latte from Pre-A-Manger. But really, I became more accustomed to the coffee culture in Wellington. I am not a coffee expert in any way, but I learned how to appreciate coffee more when I lived in New Zealand, enough to say that Starbucks is now a last option. I am lucky to have experienced proper coffee culture in one of the best coffee destinations in the world. - This is the cafe that I visited the most when I was in Wellington. I probably have been here about fifty times. This cafe is memorable to me because this is where Ei and I had our Mondates. I also love the gentle bitterness in their trim latte. And oh, their "crusty on the outside and soft in the inside" bran muffin is my favourite. - I went on dates with myself a lot at The Roxy. It's relatively close to J's work place, so I used to hang out there quite often - because I am a stalker. Haha, not really. In the summer, I would run to Miramar in the mornings then afterwards, I would rest at The Roxy with a cup of trim latte. It's a good place to chill out because they play very good 80's music and the cafe is typically quiet. - Techincally our local cafe, Tomboy is one place I couldn't really miss. I passed by this uber girly cafe almost everyday but at first, I was reluctant to join their "little community" at their communal table because it looked a bit too close for comfort. However, the cafe was (for once) empty one time I passed by, so I went inside out of curiosity. I was greeted by beautifully made cakes and pastries, then by a very friendly lady at the counter who happened to be the owner, who also bakes the cakes fresh everyday. Since then, I never hesitated to go back whenever I felt like I needed a "girlie" time. I love this cafe because people here made me feel special. They were very generous with compliments and they were very attentive. They chatted to me like I was already a part of their community when I was just a "newbie". Soon enough, it wasn't about the trim latte and the brioche anymore, but the lovely community. - J recently bought a coffee machine and the first thing that came to our minds when we first used it was our favourite coffee brand in Wellington- L'affare (Primo). How I wish they had it in London. I am glad that my friend Ei brought me to Caffe L'affare because I got to experience gourmet coffee. Really, really fresh coffee. - I didn't go to Scopa for anything else other than their hot chocolate (as recommended by Ei). It was the best hot chocolate I have ever tasted. Imagine thick, very rich chocolate topped with equally rich cream then sprinkled with some more chocolate- sounds almost like a dessert but it's actually a heavenly hot chocolate. No wonder Ei loves it! When I first had the hot chocolate, I let it sit in my mouth for a few seconds just because it was so smooth. I can't even describe it properly, but I thought that the chocolate taste actually came in the middle. I didn't taste it straight away. Then the sweetness came last. The good thing was that the sweetness was just right so I didn't feel so guilty afterwards. - We actually came here for brunch which we very much enjoyed. It was very busy when we went and I wasn't suprised. The food was good and the service was friendly. But what actually attracted me was their take away coffee cup. - The rain brought us to this quirky little place inside a garden centre in Miramar. More than their coffee, I love the "thoughts" written everywhere. - Relatively speaking, I had the best coffee ever at this cafe. Their coffee is different from those I've had before. It totally confused my palate. The multiple taste in my coffee challenged me to try and unleash whatever coffee expertise I had in me, which is very minimal I would say. But yes, fruity, sweet and bitter at the same time. Deliriously good coffee. - J found this this place when one day, we were looking for a place to have brunch. Pre-fab is apparently always busy. They are very well known for their brunch meals. We were not very impressed with the service but the food and the coffee were good enough. Nothing much to say really. Oftentimes, I can't even differentiate the taste of one skinny latte from the other. To me, they all taste the same. Or perhaps I am only saying this because I don't usually pay so much attention to the coffee. Maybe I need to visit more cafes to purposely try their coffee rather than just to meet up with people or pass time. Based on my Welly friends' recent posts on social media, it seems like summer has finally arrived in Wellington. To tell you the truth, I miss spending time with the "power puff" girls and "Daryun". 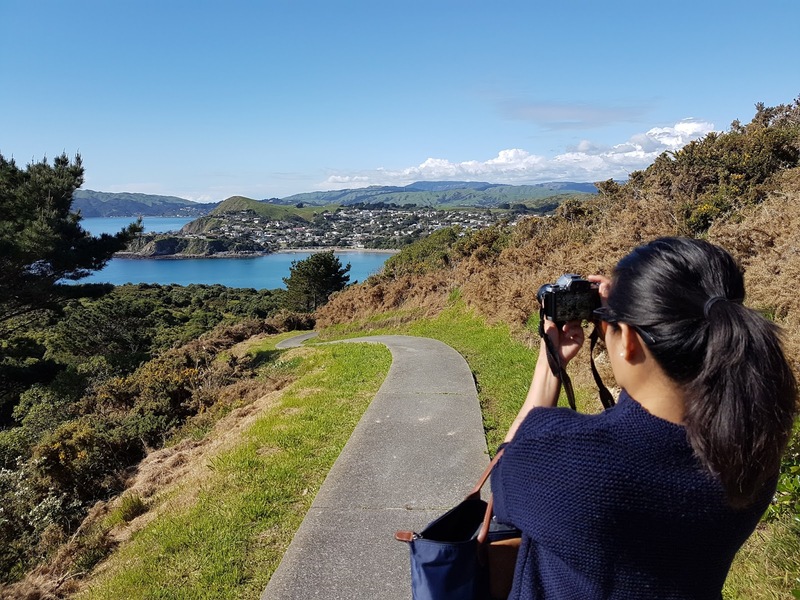 Looking at their photos always takes me back to my wonderful memories in Wellington particularly with Ei, whom I spent most of my time eating and walking while I was there. Hence, I am writing one of the last bonding moments I had with the girl who changed my perspective on life a great deal. Having stayed in the Museum Hotel for a couple of weeks when we first arrived in Wellington, I had the opportunity to eat breakfast at the Hippopotamus restaurant a few times and really had a good experience (even during those times when other people looked at me from head to toe because I was sweaty in my running clothes). During that time though, High Tea (or Afternoon Tea) was far from my mind because I still didn't have any friends then. Until of course I met Ei. Alas, I have finally found someone I could have an Afternoon Tea with. And where else would be the best place to experience my first Afternoon Tea in Wellington than Hippopotamus? Unfortunately, they were under refurbishment when I decided to take Ei to a special date, so we went to Martha's Pantry instead. But I wasn't going to leave Wellington without experiencing Afternoon Tea at Hippopotamus, so as soon as I found out they've finally reopened, I made a booking straight away. Some things have changed in the restaurant, but the ambience remained friendly and welcoming. The staff let us choose our table so I asked if we could have one by the window. As soon as we settled, she came back to go through the Afternoon Tea menu with us. As neither of us drink alcohol, we opted for the Musuem High Tea (NZ$39pp). We ordered the Rose with French Vanilla Tea which was absolutely delicious. And before we could even take a proper sip, we had to take a couple of mandatory photos to ensure that we captured the moment we were about to enjoy. And when the three-tiered selection of sweets and savouries finally came, our attention was drawn to the staff who kindly explained each and one of the delightful creations in front of us. Unfortunately, as I have such a short attention span (and unreliable memory), I could not remember a single word she said. I just wanted to eat. This is the reason why I can never be a food blogger. I will have to write down the names of all the food items in order for me to remember them and I'd rather not do that. Anyway, what I noticed about Ei and I when we have Afternoon Tea is that we start from the bottom of the platter and work our way up. Somehow we have maintained a systematic way of eating our food. Everything that we ate was deliciously rich and sumptuous. After indulging ourselves with some delicate and decadent food, we thought that that was all about it. Until we were served with an extra treat of delicious French macarons that even Cookie would have enjoyed. The view of the Wellington harbour from the restaurant is but a bonus. You go to Hippopotamus for the food, the service and the arty interior. Not that our Afternoon Tea treats didn't satisfy us, but because Ei and I have big appetite, we always have room for more food. And so after Hippopotamus, we met up with another friend for Chinese food.